A Rulebook For Your Organization - Part 1. I hate rules. Having said that, I also find the idea of "Rules which break all rules" fairly interesting. So you have thought about leading your own team? Leading an organization? Or starting something on your own? Close your eyes and imagine that I am handing you your dream organization. Giving it to you. Just like that. What I want you to do instead, is give me a detailed Rulebook of things that you will absolutely do and not do in your organization. Well not the 'rules' per say but the overall guiding principals. Things that will become the foundational building block for your organization. Scott Berkun one of my favorite mavens on the subject of innovation, responded to the question with a rather interesting tweet. The response is particularly interesting because even though I have always enjoyed working with folks who have a sense of humor and have always been a little uncomfortable around people who take themselves way too seriously, I never quite saw it as a criteria for hiring individuals. Sometimes you need someone else to pin it down in exact words for you to realize how strongly you believe in an idea. A collection of really small posts highlighting things that matter to me (and hopefully you) when building your own team or your very own small organization. It's the organizational rulebook for a kickass environment. 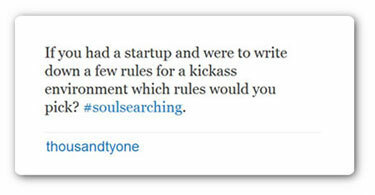 If you had a startup and were to write down a few rules for a kickass environment which rules would you pick? Time to compile a few of these that come to mind and any others you might think of in a series of post. Go on. Click the comment link, send me an email or send me tweet at @thousandtyone and contribute.